This is a collection of short stories in 2 parts: Part One: Algeria: between desire and death, Part Two between France and Algeria. Together they explore the realities of how war tears countries and families apart as they struggle for independence or with civil war and how this struggle impacts the lives of ordinary people. Pawns in the games of war, the lives of women and ultimately their bodies become the debris of the fighting and are strewn across the landscape, across meaningless geographical and political borders. 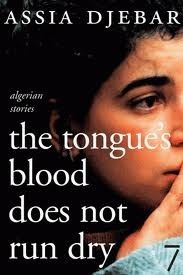 I have read that her writings are inspired by the stories of Algerian woman who had fled to Paris. Reading them today makes one think not only about the historical times which the author is writing about (All the stories were written in 1995 and 1996—a time when over 200,000 Algerians were killed in Islamist assassinations and government army reprisals) but of Syria today where we see news photographs of the fighting above ground and the old, the young and the women in their subterranean shelters trying to survive and can only imagine what it was like before such conditions became the everyday norm. For example, “Oran, Dead Language” tells the story of an Algerian woman in France writing to her Sardinian friend Olivia to explain that she is going back home to Oran to await the death and funeral of her mother’s sister who brought her up after her parents, trade union activists who were assassinated in the lead up to the country's 1962 Independence. In “The Woman in Pieces” the author interweaves a Scheherazade story from the classic 1001 Arabian Nights about a mysterious woman found cut up into pieces inside a roll of carpet with the story of a French Professor using it in her class studying the differences between the French translation and the Arabic original. She is murdered and decapitated for teaching obscene stories in front of her class. “Annie and Fatima” are mother and daughter, divorced parents, separated between France and Algeria. Annie has not seen her daughter for 9 years as she lives with her father. Taking advantage of law changes, she begins to learn Berber at night school in order to be able to talk to Fatima when she visits for the first time. ashramblings verdict 3*: This is a challenging read – making us to contemplate a time and situation most people in the UK would know little about, whilst hoping we never have to experience any of the experiences the woman of these stories had to go through.